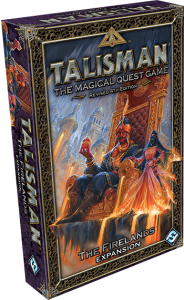 Fantasy Flight Games is pleased to announce a new expansion for Talisman. This one's called The Firelands. Fantasy Flight Games is proud to announce The Firelands, a new expansion for Talisman Revised 4th Edition. The land of Talisman will face a dire new threat in the legendary Ifrit, once forced to create the Crown of Command. Now, the Ifrit rise again, intent on burning every field to ash and enslaving the surface dwellers. Your quest for the Crown of Command is about to become more frantic and dangerous than ever before.